After countless discoveries about the science of Enterprise Architecture from the Zachman Framework 3.0; and due to unprecedented demand, we are proud to offer the Zachman Certified™ - Enterprise Architect program. This 4-day, hand's-on modeling workshop, we develop the science behind EA, as derived from the Zachman Framework Ontology. We'll be looking at real-life examples and case studies from real consulting projects and finally give you the ability to answer the question "how do I use The Zachman Framework?" We "workshop" how to build and implement PRIMITIVE models and then actually see how that once you get some primitives built, then creating and changing the composite models and implementations in order to get at General Management problems is quite simple. We explore this by using several methodologies and tools that will help you "implement" the Zachman concepts in your enterprise. Understanding this "science" offers great capability to EAs for analysis and simulation solutions in their enterprise. It is a different EA paradigm! This Level 1 course not only prepares you to take the Level 1 Zachman® exam in order to obtain your Zachman Certified™ - Enterprise Architect Associate (Level 1) designation, but also prepares you to present your case study for designation as a Zachman Certified™ - Enterprise Architect Practitioner (Level 2). The Zachman Certified™ - Enterprise Architect program enables working professionals to develop the theoretical and technical skills needed in the 21st century workplace. More and more companies are looking for employees or consultants who can demonstrate command and deliver results in this wide body of knowledge. Some of those now even making Zachman Framework™ certification a requirement. A distinctive element of this program is "reality-based learning," or the process of integrating theory with work and life experience. Practical in its design, the Zachman Certified™ Courses gives today's Enterprise Architects the opportunity to strengthen their skills as well as broaden their understanding of industry trends and the use of The Zachman Framework™. This program grants a professionally relevant certification, opening up opportunities for career advancement and enhanced marketability. It is also a valuable tool for companies and organizations striving to set a higher standard for internal and external performance assessment, establishing hiring criteria, and improved market positioning. Certification requires taking the necessary Zachman courses and passing of the objective Zachman Enterprise Architecture Examination. This is a life-long commitment to professionalism in your chosen career in the IS/IT field. Your certification is equivalent to the same level of credential as available for Doctors, Accountants and Engineers. Each candidate in the Zachman Certified™ program, can view their individual transcripts on Zachman.com (available early 2012). 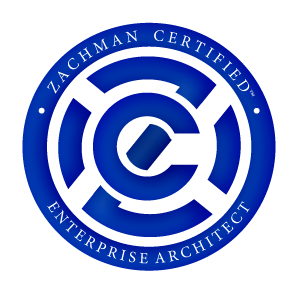 Once certification is complete, each Zachman Certified™ – Enterprise Architect is searchable by anyone on Zachman.com. Their listing will include their achieved Zachman Certified™ level (1, 2, 3 or 4), if their status is current, along with their unique Zachman Certified™ seal with embedded Architect ID. "If any person or company claims to do something with, or know something about The Zachman Framework, or they claim to be Certified in The Zachman Framework and their name does not appear when searched on the Zachman International at Zachman.com, then I would have to question the veracity of their claim and whether or not they actually know anything about the fundamental concepts embodied in The Zachman Framework." Zachman Certified™ - Enterprise Architect Associate (Level 1): Our new Level 1 certification now has far more practitioner based experience than ever before! Not only will you learn the concepts surrounding the science behind The Zachman Framework and Enterprise Architecture, but you will be able to follow real case studies from real organizations and then practice building models as defined by The Framework. For many years, people have asked "how do I implement The Zachman Framework?" Well, that is somewhat like asking, "how do I implement the Periodic Table of Elements?" It's not really possible to implement an ontology (both The Zachman Framework and the Periodic Table are ontologies). However, in our new class, we look at the various methodologies used to employ the science of The Framework to produce ARCHITECTED (or engineered) Enterprise implementations (much like you use chemical processes to employ the science of the Periodic Table in order to produce compounds - or implementations). If you want to ENGINEER your Enterprise, then we will define and teach you the difference between "Primitive" (engineering) models and "Composite" (manufacturing) models. The elegance of acquiring this skill lies in the ability to "slice" out the "primitive" models from your organization so that you can diagnose the real life problems you are facing in very little time; delivering immediate results! The IT community has been building "composite" implementations (or models) for many years. Our research has shown that building these composite models (with multiple concepts hard-bound together) not only makes your systems, and by default your Enterprise, extremely inflexible, but the composite models provide only a point in time "snapshot" of your organization. This is like taking an x-ray of a particular part of your body for a problem and then keeping the x-ray and looking at it when a new problem arises in a different part of your body at a future date. The body is built of primitive (single-variable) components just like your Enterprise is. Understanding the primitive components, then parsing them into composite models (or implementations) lets you take MULTIPLE snapshots of problems at ANY TIME giving you traceability and diagnosis for implementing immediate results. THAT is what The Zachman Framework can do for you! Also, our Level 1 course has a certification fee associated with it now (included in the price of each course). What this certification fee gets you is access to the 4-day workshop and the ability to take the 2-hour on-line exam once you have completed the course. Upon passing the exam, you are then appointed as a Zachman Certified™ - Enterprise Architect Associate. However, there's more- your certification fee also covers your Level 2 certification. You may submit your case study for the Level 2 "Professional" certification consideration with no further cost! As you can see, the Zachman Certified™ - Enterprise Architect program is back and better than ever! Register today at one of our locations around the world! The Zachman Certified™ - Enterprise Architect Practitioner (Level 2) is an enhancement and extension of the Zachman Certified™ - Enterprise Architect Associate. The Professional separates the practitioner from the master by building on the basic certification through acquiring a methodology capability and demonstrating how that methodology can be extended to produce primitive (architecture) models from which its composite (implementations) models are derived by delivering a case study. These extensions would be demonstrable by mapping the primitive architecture models against the methodology artifacts as well as by submitting actual case examples of the primitives and the composites for referee review. The Zachman Certified™ - Enterprise Architect Professional (Level 3) is an enhancement and extension of the Zachman Certified™ - Enterprise Architect Practioner. The Professional separates the practitioner from the master by building on the basic certification through acquiring a methodology capability and demonstrating how that methodology can be extended to produce primitive (architecture) models from which its composite (implementations) models are derived by delivering a case study. These extensions would be demonstrable by mapping the primitive architecture models against the methodology artifacts as well as by submitting actual case examples of the primitives and the composites for referee review. The Zachman Certified™ - Enterprise Architect Educator (Level 4) designation is a publicly acknowledged qualification for educators that desire to create and teach curriculum designed to employ The Zachman Framework™ concepts. The basic requirement for this designation is the Zachman Certified™ - Enterprise Architect qualification which includes all of the basic education material on The Zachman Framework™. It would be highly desirable for the Educator to acquire the Professional qualification as well, however the Educator may well have defined their own methodology. Therefore, their methodology would obviate the requirement to receive instruction on another methodology. They could map the primitive models against the artifacts of their own methodology and provide a case study for review. The Educator would also be required to submit their curriculum and presentation materials for review and validation.